Foot rot or foot scald can occur if you wrap the entire foot. Avoid this by keeping the bandaging wrap above the foot if possible. Watch for infection and call a veterinarian if you detect any. If the break is above the knee or hock, fold the leg and tuck it up against the sheep’s body and secure using bandaging tape. Keep the animal in a small enclosed area for four to six weeks. Clean the bedding daily so the leg remains dry. Change the bandaging once a week. If the bandage gets wet, replace it immediately to avoid infection. Breaking a leg is fairly rare for a sheep, but it can happen. 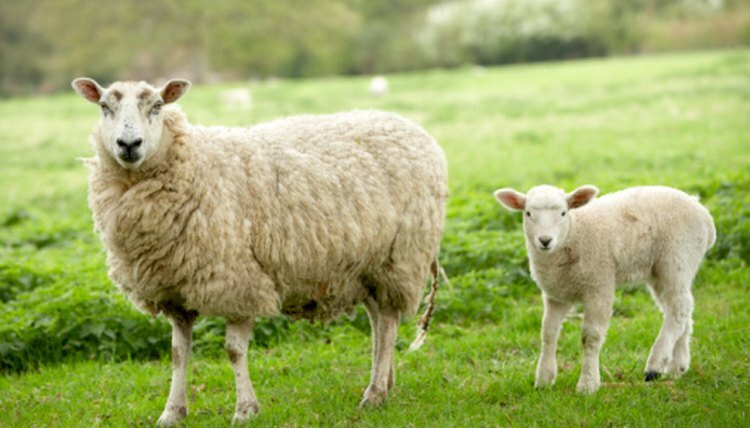 Sheep are agile, curious animals and sometimes that can lead to leg fractures. Since sheep are prey animals, their instinct is to stay with the herd no matter what. Once you detect a fracture, gently separate the animal from the herd and move it into a small enclosed area. Examine the sheep's leg to see if the broken bone has penetrated the skin. A broken leg without broken skin has a good prognosis for recovery. Wiggle the bone to determine exactly where the break is. Knowing this will help determine how you stabilize the leg. The broken sections must be kept together in order for the bone to heal properly. Measure from above the joint that is above the break to below the joint that is below the break using a measuring tape. The joints both above and below the break must be immobilized. Decide what type of splint to use and cut to length using a saw. Wooden lath or 1/2-inch PVC pipe are alternatives to splints purchased from a veterinarian. Wrap the leg in cotton wrapping. If wrapping is unavailable, use strips of cotton cloth. Completely cover the area to be splinted. Cut off excess cloth using a scissors. The wrapping should be snug, but not tight enough to cut off blood circulation. To detect swelling, do not wrap the animal’s toes. Hold the splint next to the leg. Using the bandaging tape, wrap the leg and the splint together. Wrap above and below the splint so the animal cannot knock the split off. Examine the wound to see if the bone has penetrated through the skin. If the wound is clean and the opening in the skin does not require stitches (approximately 1 inch or smaller), flush with antiseptic wash and follow the steps for a closed fracture. Examine the wound. If the opening in the skin is greater than 1 inch, call a veterinarian. Determine the animal’s worth. Contaminated bones do not heal well. Vet bills, antibiotic therapy for a bone infection, or amputation can be expensive. Consider euthanizing the animal immediately.